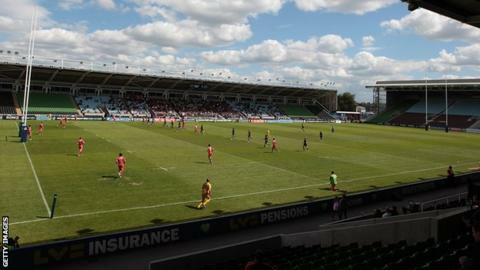 London Broncos say they are considering staging more games away from the Twickenham Stoop. The Super League side played games at Leyton Orient's Brisbane Road and Gillingham's Priestfield Stadium earlier this season. Chief executive Gus Mackay told BBC London 94.9: "They ticked a lot of boxes and we're pretty pleased with the way those two games went. "It's certainly something we'd like to do again in the future." He added: "A lot of new people came through the gate, which is what we wanted to achieve - with the idea they will come and watch us here [at Twickenham Stoop]. A crowd of 2,844 saw the Broncos lose to Bradford Bulls at Brisbane Road while 3,930 attended their narrow defeat to Hull at Priestfield Stadium. "In terms of numbers, they didn't deliver what we wanted," Mackay continued. "But compared with what we've been getting at here [at Twickenham Stoop], they were above [those] attendances." However, due to both games being staged in May, the Magic Weekend and their Challenge Cup fixtures, the Broncos went nine weeks without hosting a Super League game at Twickenham. But with an average attendance of just over 2,500 for Super League games at the Stoop, Mackay admits the club will have to carefully consider which matches to take to different grounds in the future. "I hope we can find a balance," he said. "You need a home base where you play 80 or 90% of your games but the idea of taking games to a new audience is the way we see developing the game and getting more people interested and watching. "If you're going to do it and make them annual events you'll need to give those venues that we've done certainly another year or two, and maybe use another venue as well. "You could do a model that would be 10 games at home and three on the road. "I think it's important you try and select the right opposition as well and make a big thing of it so it becomes an annual event in everyone's calendar."